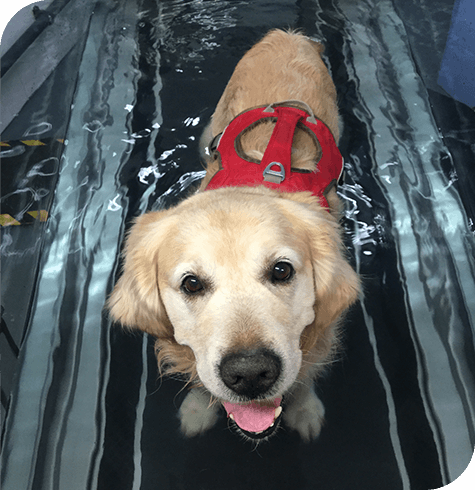 At Aireworth Vets we offer Canine Hydrotherapy; this is also available to non-clients as a referral. We have 3 Veterinary Nurses who have completed their Level 3 Certificate in Hydrotherapy for Small Animals. What will happen during a Hydrotherapy session? One of our qualified Hydrotherapist nurses will give your pet a health check, weight check and talk you through the session. The Hydrotherapist will ask you a series of questions about your pet’s lifestyle, exercise, medication and diet. Your pet will be fitted with a harness and we will take muscle measurements. We will then shower your pet and take them onto the treadmill. Water will be added in small amounts to enable your pet to become accustomed to the noise and water. Most patients will be on the treadmill for 3 minutes at the most on their initial assessment; they will then be showered and dried. Yes, Hydrotherapy is run on a referral basis only. Your Veterinary Surgeon must refer your pet to the Hydrotherapy team. They will then look at your pet’s history and contact you to arrange an appointment. We usually recommend around 10 sessions initially starting with 1-2 sessions a week; this can be continued monthly for maintenance thereafter. If you would like further information about Hydrotherapy, please contact the practice on 01535 602988 to speak to one of the Small Animal Team.